Button eryngio, Eryngium yuccifolium Michx. Button eryngio is an erect native perennial reaching to 5 feet high on stiff, green smooth stems, unbranched up to the inflorescence. Leaves are alternate, long, stiff, narrow to a sharp point and have spiny edges. Most leaves of any size are near the base of the stem. These leaves can grow to 3 feet long. Upper leaves are small. A characteristic of the leaf is the parallel vein structure. The leaf clasps or wraps around the stem with a long sheath. 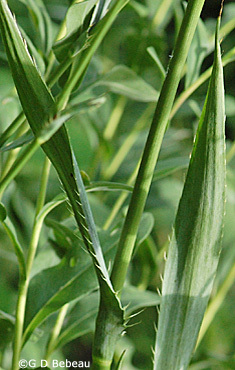 Stems and leaves are hairless, bluish or grayish green. The inflorescence consists of long stalked terminal branched clusters (cymes) that are usually 1 inch round balls covered with tiny flowers. These heads are contracted umbels; the clusters can also spring from an upper leaf axils. 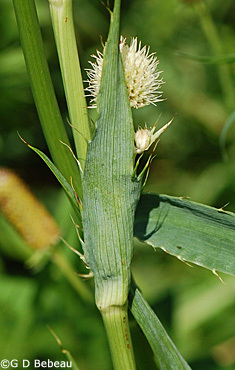 The base of the stem of an inflorescence has a cluster of small leaf-like bracts as does each branch within the inflorescence. The flowers are 5-parted, with whitish tubular corollas that flare at the tips into 5 petals which usually are notched at the tip. The five white filamented stamens have brown anthers for contrast. The style is divided. Both stamens and style are greatly exserted from the corolla. The calyx is much reduced. Each flower has prickly green bracts and the entire umbel ball has at its base a small rosette of small bracts. In bloom, the flowers have a honey-like scent. Seed: The flowers mature to a scaly dry fruit that splits into 2 seeds. Seeds require 60 days of cold stratification for germination. 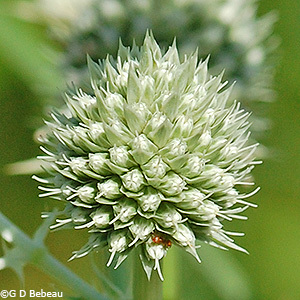 Habitat: Button eryngio grows from a small bundle of roots and a taproot into a stout stem in dry-mesic to wet-mesic prairie environments. An unusual plant for its strap like leaves and spiny margins, resembling the yucca of the southwest. It is easy to grow in the home landscape in well drained soils with full sun. Names: The genus name Eryngium is a Greek word for an ancient Greek plant that has characteristics of this genus. The species name yuccifolium, refers to the yucca-like leaves. 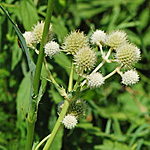 A different plant of this genus, Eryngium aquaticum L., is more correctly known as Rattlesnake-master, and is so termed by USDA and other authorities. 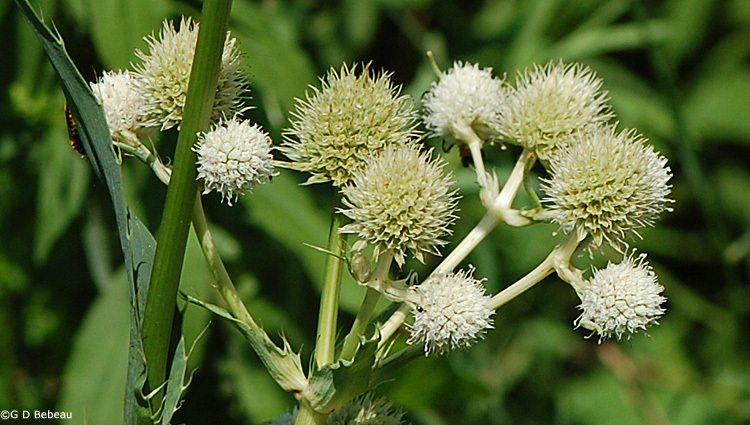 Eryngium aquaticum is native to the U.S. east and gulf coasts, but not inland. Some references will confuse the two as the common names have been used interchangeably. The name 'eryngo' is derived from Eryngium used as a sort of common name to refer to a singular type of Eryngium thus adding to the confusion. [Note: Eryngio is also spelled eryngo in many references.] 'Button' refers to the round umbels looking like large buttons. The 'snakeroot' part of the names is a reference to medicinal properties said to treat snakebite, but that too seems to be misleading for our species as explained in the "Medicinal Notes" below. The author name for the plant classification - ‘Michx.’ is for Andre Michaux (1746-1802), French botanist who made many exploring expeditions in the U.S. collecting and cataloging many species. Two important works were the Histoire des chênes de l'Amérique septentrionale (1801 - Oaks of North America), and the Flora Boreali-Americana (2 vols., 1803). His son Francois, traveled with him and the father’s notes were later used for the 3-volume North American Sylva, for which Thomas Nuttall provided some supplements. Comparisons: In our area and the central U.S. there are no other plants that are confusing with this species. 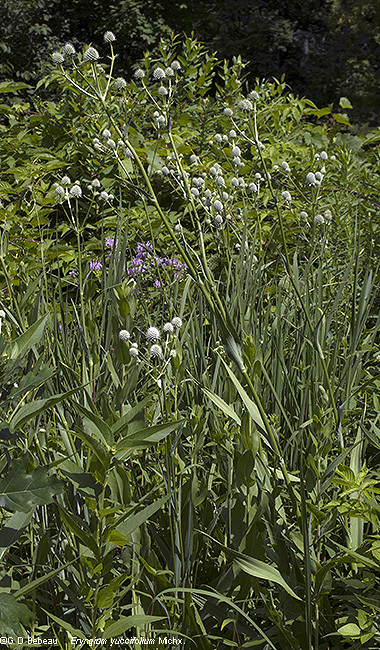 Above: A grouping of the tall plants of Rattlesnake Master. 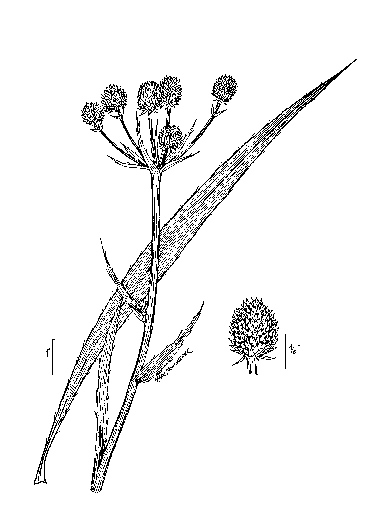 Drawing from USDA-Plants Database. Below: 1st photo - The stem branching only occurs in the inflorescence. 2nd photo - The strap-like and yucca-like leaves with spiny edges and parallel veins. 3rd photo - Some of the flower branches can spring from a leaf axil. Note the fully clasping base of the leaf. Below: 1st photo - The rosette of leaf-like structures can be seen around the outside edges of this flower head that has not yet bloomed, and subtending each small unopened flower is a prickly green bract. 2nd photo - The white flowers had stamens with light brown anthers and prickly bracts. A honey-like scent is produced when in flower. Below: Note the bracts at the base of this inflorescence and at each branch of the inflorescence. Notes: Button eryngio was first planted in the Garden by Eloise Butler on Oct. 16, 1923 with plants sourced from Denison Iowa. She added more in 1924 and '26. Martha Crone planted it in May 1953 from Walter Lehnert (future Friends member and President) and again in 1955. it died out after some time and was replanted in 1993 by Cary George and was recently re-planted by Curator Susan Wilkins. It is found in the U.S. from the gulf coast up to Nebraska, Iowa and Minnesota and then east to the east coast, excluding New England, NY, PA, and WV. In Minnesota it is known mostly in the 3 southern tiers of counties in the SE quadrant, from Brown, Watonwan and Martin eastward to the Wisconsin border; 22 counties in all. Absent in the metro except for Dakota County and Scott County. 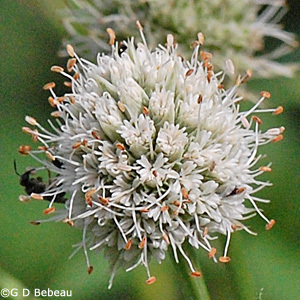 Rarity: Eryngium yuccifolium is the only representative of the genus found in Minnesota and it is so uncommon in the wild that it is listed on the State 'Special Concern' List. Some references list E. aquaticum as present in Minnesota (including USDA) but the Minnesota authorities at the U of M Herbarium and the DNR state that is not found in Minnesota. 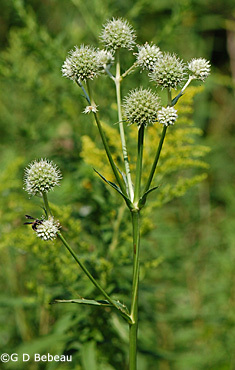 Medicinal qualities are attributed to members of the Eryngium genus and those referring to Rattlesnake-master are probably alluding to the aquaticum species. The root of that species is tuberous and was used in solutions to treat many maladies including liver problems, uric acid build-up, hemorrhoids, gonorrhoea and snakebite. Hutchens (Ref.#12) in Indian Herbalogy of North America refers specifically to E. aquaticum with no mention of E. yuccifolium, and neither does the USDA Plants Database, yet some individual articles attribute the same attributes to E. yuccifolium.